Before we get to that, let’s get up to speed on what ransomware is. 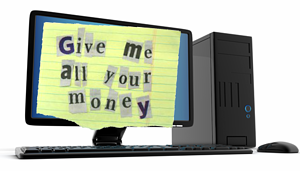 Ransomware is a program that is commonly associated with computer viruses and malware. While they aren’t exactly the same thing, they are harmful to your computers and ultimately your business. Ransomware starts with getting access to your computer and starts to encrypt all of your files with a strong encryption key, preventing you from access your files. Typically you’ll see a screen that demands you pay a certain amount of money, almost always in BitCoin (a form of cryptocurrency), to get the encryption key and gain access to your files – hence the “ransom” part. The longer you wait, the higher the cost of the ransom. Those that pay the ransom are typically listed in underground cyber criminals network as a “mark that pays” and are targeted by other criminals with repeated attempts. A: Protection is easier than you probably think. Most systems that are on a supported operating system setup to receive critical Windows updates on a regular basis, have already received this patch back in March of 2017. Users can install Update MS17-010 (https://technet.microsoft.com/en-us/library/security/ms17-010.aspx) that fixes the vulnerability for this type of attack. To be proactive, you need to stay protected. Don’t open links or attachments in emails that you didn’t ask for or didn’t expect to receive. A lot of criminals use targeted attacks (called phishing or spear phishing) with information that may look legit to draw you into opening a link or attachment. If you do, this open up your PC to their control and all of your information that’s on it. When it doubt, throw it out (or call and ask if it’s legit). Don’t give out sensitive information. Social engineering (conning someone into giving you information) is easy to defend against. If someone is asking for sensitive information and you can’t confirm that they are who they say they are or that they need it – don’t give it out. Call someone who can verify who they are and that they need it. Have a professional Anti-Virus/Anti-Malware product in place and keep it updated. Some off the shelf products are great for security but some perform better than others. At the very least, having it installed and making sure it gets updated is a solid layer of defense. Make sure you are on a supported operating system and it gets updates on a regular basis. In the world of software, there is a constant battle between those that find exploits in software and those that fix them. You may get tired of the constant notifications or updates but they are there for a reason. Stay updated and stay safe. In the technology world, there is no real "set it and forget it". At some point, everything needs to be updated and keeping yourself updated is just one piece of your business. At Skurla's, we value our customers - let our team help you stay updated and protected with honest solutions.